PORT DOVER – For John Vallee and his crew, winning has become routine — some might even call it a ‘Ritual’. 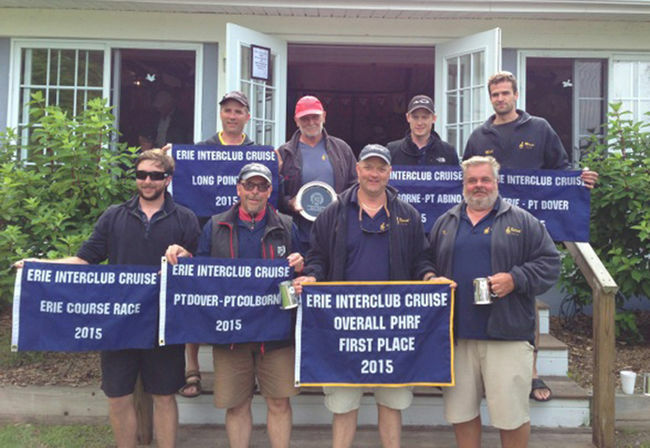 The sailing team representing the Port Dover Yacht Club added yet another accomplishment to its legacy by winning both the ‘B Fleet’ and overall championship at the prestigious Lake Erie Interclub Cruise July 1. It was the second time since 2010 that the group aboard Ritual had won the five-day event, a race that stretches from Erie, PA to Long Point, Port Dover and Port Colborne before finishing in Buffalo. “It’s pretty satisfying to do that,” said Vallee, the boat’s captain and a Simcoe resident. “With sailboat racing, you can go with a fantastic crew and a fantastic boat but you’ve got to have the right weather conditions for your boat compared to the others because all the boats are different. In 2010, Ritual became the first Canadian entry to take the race’s overall championship since 1996. Just like that fateful journey, the 35-foot, J-Boat faced an uphill battle and performed admirably this summer. So too, said Vallee, does his crew, one that brings a wealth of sailing knowledge to the table. In addition to the overall titles, the team has been a fixture atop the race’s B Fleet standings for the past decade. “I have a superb crew, I really do. They’ve been with me a long time and there’s literally hundreds of years of sailing experience on our boat compared to maybe dozens for other boats,” said Vallee. That experience lends itself to making strong choices for the long term, even if they don’t make those decisions as quickly as other crews. “It’s very much a community, consensus decision-making type of arrangement. Some boats will have one guy and he says, ‘we’re doing this’ and that’s what they do. (With us) there’s a lot of discussion about options, alternatives, ‘what if we do this’, ‘what if we do that’, ‘what do you guys think?’ The group comes around to a decision – sometimes after quite a bit of discussion,” Vallee laughed. The roster is made up of 13: Scott Persall, Peter Ryerse, Mike Grummett, Matt Vogelzang, Tyler Wilson, Mark Boerkamp, Vallee, Keith deMontfort, Don Lees, Mark Kohli, Steve Shaw, Larry Hewson and Brooke Snow.